So it was just the Italy Trio, JB, Pat and I. Funny thing but we duplicated a day from an earlier trip. First off, since the day was cold and clear, the London Eye. I must be getting older – I used to dangle 2000 feet in the air in an ultralight. 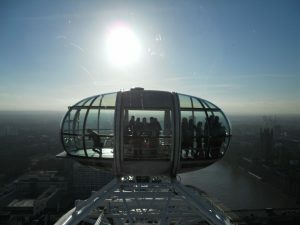 Now the trip up the eye gave me a bit of vertigo. Nothing bad – focused on pictures and forced my mind to be logical (the damn thing is not going to pop off the hub and roll along the embankment!). Got some nice shots, too. 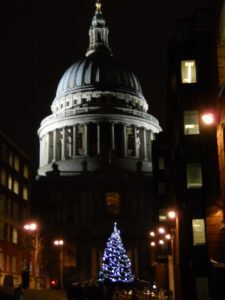 There were Christmas booths along the Thames south bank so we wandered these; bought JB a cup of hot chocolate. Yum! Stopped at a bookstore, had lunch in a bistro, just wandered east along the bank. There is a grotto under a broadcasting building with pillars and steps and such that might or might not have been specifically constructed for skateboarders and bike-stunters. It isn’t padded, they let graffiti go up (openly – Pat carefully watched how one guy did it (look out, Norfolk!)). There was an implication hanging here – clatter and spray and tumble and fracture all you want here, but leave the rest of the city alone. Seems to work. It had the air of the thrasher petting zoo. 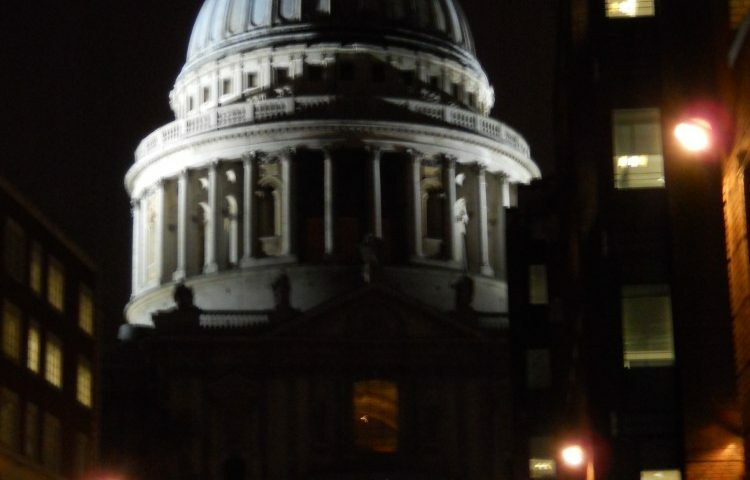 Crossed the Millennium Bridge in darkness, St. Pauls illuminated before us. It was so pretty, it would make a great Christmas card if we hadn’t done it two years back. Tubed back to the hotel where I dropped the ladies off. Went back alone to King’s Cross, to check out a railroad club I’d seen a number of years back. Since it was two days before Christmas, it was pretty sparse (five people). We chatted about model railroads and I watched a couple of trains drill around a test track. I’m sure the same chair-filling, Midway-rebattling laziness had gone on at my club the day before. But I’d seen an advert in the Tate Modern for the Tate Britain, something about… the Apocalypse!